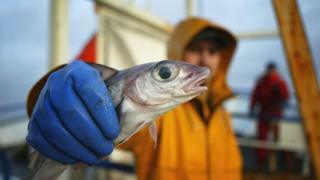 Fishermen's leaders have urged ministers to rule out a long Brexit transition as officials meet in Brussels for fish quota talks. The Scottish Fishermen's Federation (SFF) said only a nine-month transition period was needed for UK fleets to leave the Common Fisheries Policy. It said fishermen would resist attempts to force them to comply with EU regulations beyond what was necessary. The talks on catches could be some of the last before Britain leaves the EU. SFF chief executive Bertie Armstrong said: "A transition period should be precisely that, not an excuse simply to extend by two years the period during which we are shackled to the utterly inequitable and hopelessly inadequate Common Fisheries Policy (CFP). "The prime minister was clear in her Florence speech that for certain sectors of the economy matters could be settled more quickly than two years and the case for a nine-month 'bridge' for the fishing industry is absolutely compelling." Mr Armstrong has written to ministers in the Scottish and UK governments outlining the position. He added: "At the December Council of European fisheries ministers in Brussels this week, fishing opportunity will be set for member states, including this country, for 2018. "By December 2019, nine months after we have formally left the UK, we will have attended the series of negotiations setting sustainable fishing opportunity in the north-east Atlantic as an independent coastal state, any other approach would make no sense whatsoever." Mr Armstrong said there was no need for a "fishing related cliff-edge" and that a bridge would give "clarity and assurance to the UK fleets and those of the EU member states". Meanwhile, Scotland's Rural Economy Secretary Fergus Ewing has called on the UK government to ensure the interests of Scottish fishermen are fully represented at the council on Monday where UK ministers negotiate for the whole of the UK industry. The Scottish government is pressing for increases in cod by-catch levels in the west of Scotland, more geographic flexibilities for boats to support the landing obligation and adjustments to quotas for west of Scotland prawns and Northern Shelf Ling. Mr Ewing said: "Scotland is strategically placed to have the biggest and best fishing industry in Europe and is home to one of the largest fishing ports in the UK, so it is crucial the UK government puts the post-Brexit uncertainty to one side, and focuses on the day job of championing the interests of the sector, both onshore and offshore."